It is not a fancy feature-filled electric toothbrush, but for its money the Sonicare Easyclean is a great buy. It is an affordable way to keep your teeth clean and healthy. 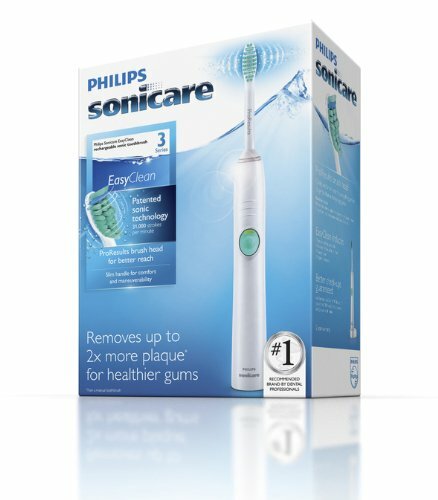 The Philips Sonicare Easyclean is not a top range model like the Philips Sonicare DiamondClean. It has more basic features and much reduced versatility. But it’s still a great a recommendation for anyone who wants to go a step up from their manual toothbrush. The Sonicare Easyclean is designed to be gentle on the teeth yet thorough on plaque and stains. It can reach the farthest reaches of your mouth and those hard to reach areas between your teeth. If you are looking for good quality electric toothbrush that will clean your teeth well without running you broke, we recommend the Easyclean. This is a technology that has been applied to the Sonicare range of toothbrushes. With Dynamic cleaning action, Sonicare brush heads are able to penetrate deep between the teeth and along the gum line where foods easily get stuck. If you have a bad breath problem, it could be because your manual toothbrush does not reach all areas of your mouth properly. The Easyclean electric brush might be of help. It is also great at removing plaque that has built up on the teeth. After just a couple of weeks your teeth will feel and look much cleaner. This is not really a new technology but a nice one all the same. The bristles on the brush head are designed to gradually fade with time. This is an indicator for when you should change your brush head. Dental experts recommend replacing the brush head every three to four months to maintain proper cleaning performance. But most of us don’t pay attention to how much time has passed since we bought something. It’s easy for six months to go by without replacing your brush head. The reminder bristles make it much easier to remember. If the bristles have started fraying, that’s even more reason to shop for a replacement. Dentists recommend brushing your teeth for no less than 2 minutes, twice a day. But have you ever really counted down the seconds while you are in the bathroom brushing your teeth? My guess is no. Even if there are a zillion apps you can use to time your brushing sessions, few people take their phone to the bathroom. All Sonicare toothbrushes are fitted with a 2-minute automatic timer. After the two minutes are up, it will automatically switch off the toothbrush. Even better, the Sonicare easyclean divides the time into four intervals representing each quadrant of your teeth. When you brush one quadrant for 30 seconds it nudges you to move to the next one. This is one of the things I was talking about when I mentioned the reduced versatility of the Sonicare Easyclean compared to other pricier alternatives in the series. It comes with only a basic cleaning mode. It lacks the Deep clean, Sensitive, White and Gum care modes found in the Sonicare DiamondClean. With a single charge, the Sonicare Easyclean can last a whole three weeks. This comes to around 42 brushes of 2 minutes each. So you can pack the toothbrush in your travel bag knowing it will not run out of power even if you are going into the wild for a couple of weeks. Really easy. When you get the toothbrush, make sure you charge it first for 24 hours. The manufacturer recommends this so as to keep the battery working for longer. After the first 24-hour charge you can continue using and charging it as normal. With only a single on/off button, using the Sonicare Easyclean is a breeze. You’ll notice there is an LED indicator around the button. It indicates the battery level. It will start flashing when the battery goes too low. There are no accessories that come with the electric toothbrush nor do you need to buy any. Unlike with other more expensive toothbrushes in the Sonicare series, you don’t get a travel charger and bag. But with a 3-week charge you can simply put the brush in your bag and hit the road without worrying about a dead battery. You may not notice it but the toothbrush will not function at full power at first. It builds up intensity over the first few sessions. This allows you to get used to it and helps avoid applying too much pressure on your teeth and gum.